The 2006 season started with a bit a a disaster. Having little time to prepare for the first event at Bristol, we hooked for the first time and selected the wrong gear. This meant the engine revved much more than it should, and so part way up the track there was a big bang resulting in quiet a few of the engines internals arriving externally. 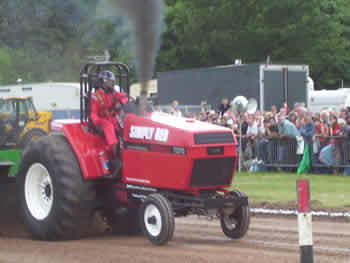 We new that with any highly tuned engine this could happen, but not our first pull !!! We rang round to find a replacement engine and soon found 4 secondhand units we could convert into the Prostock spec. We rebuilt the Tractor, but with John off on hols to the USA. 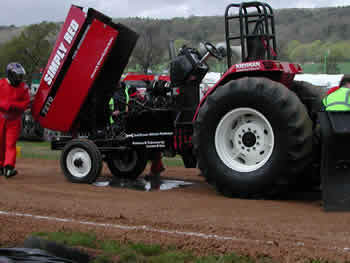 It was left for Alistair Parkinson to take the seat at the next event , a demo pull at Shrewsbury. He managed 2 full pulls but we thought the Tractor was not performing as it could. With advise from the Rough Justice Team & Chris Wilkinson we decided to advance the pump timing for the next event at Gt. Eccleston. We got ready for the pull at Gt. Eccleston Show, John sat in the seat ready to be called to the sled when it was noticed oil & water coming out of the breathers. We dropped 6 places and the Desperate Dan Team performed a quick oil change for us, no panic just the same professional team work that has won them 14 European Titles. John hooked to the sled and gained his first full pull , then returned to get 3rd place in the pull off - what a result!! After the show we stripped the engine to find a cracked cylinder liner had caused the oil & water mix , soon fixed this and the rest of the season went without a problem. We completed the 2006 season having done 22 runs and finished 5th in the British Championships , not bad for our first Prostock season.